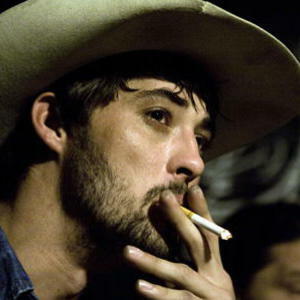 George Ryan Bingham (born March 31, 1981 in Hobbs, New Mexico) is an American folk rock/Americana singer/songwriter. He dropped out of school at 17 and was introduced to rodeo bull riding. He learned the emotional aspect of pain early in life, when shuttling between small towns and family members in the hardscrabble ranching communities of West Texas and Hobbs, New Mexico -- and became well-acquainted with the physical facets of pain during his years on the Southwestern rodeo circuit. He dropped out of school at 17 and was introduced to rodeo bull riding. He learned the emotional aspect of pain early in life, when shuttling between small towns and family members in the hardscrabble ranching communities of West Texas and Hobbs, New Mexico -- and became well-acquainted with the physical facets of pain during his years on the Southwestern rodeo circuit. That ache is palpable in the grooves of Mescalito, Ryan Bingham's Lost Highway debut, but what's even more plain is the steely strength needed to overcome it -- a tenor that's evident in both the singer-songwriter's preternaturally wizened voice and his remarkably poignant songs, which resonate with roadhouse wisdom and rough-and-ready border-town piquancy. The Beg For Broken Legs Songfacts reports that Bingham's fourth album, Tomorrowland, was recorded in Malibu, California with producer Justin Stanley and self-released through Bingham's new independent record label Axster Bingham Records on September 18, 2012. He has won an Oscar for the best film song (Crazy Heart - The Weary Kind) in 2010. Influences include Bob Dylan among others.